EL SEGUNDO, CA — Just one day before the first of their final two pre-season games this weekend in Las Vegas, the Los Angeles Kings are still trying to get everything together for the fast-approaching 2013-14 National Hockey League regular season, which is just one week away. To illustrate, despite the fact that he looked like he was in mid-season form, especially during the first period of a 2-1 pre-season win over the Anaheim Ducks at Staples Center on September 24, goaltender Jonathan Quick indicated that there is still work ahead. At this point during an NHL team training camp, players often just want to get the regular season going. But Quick acknowledged the importance of pre-season games. One of the question marks heading into the new season is who will play on left wing on the Kings’ second line with right wing Jeff Carter and center Mike Richards. To this point, forward Matt Frattin, who was acquired during the summer from the Toronto Maple Leafs as part of the trade that sent goaltender Jonathan Bernier to Toronto, appears to be the front-runner. “I’m probably going to playing on the left side all year, so I’ve got to get used to it, and just keep working on it in practice,” added Frattin, who also indicated that he seems to be blending in well with Carter and Richards. “We’ve had glimpses of good chemistry and plays that we’re making, but we’ve still got to work on it a lot more,” he noted. Frattin took note of the differences between the systems of his old and new teams. “I just have to try to keep learning the systems, keep working, and try to get ready for the regular season,” he added. Defenseman Jake Muzzin has been held out of recent training camp practice sessions, as well as the September 24 pre-seasongame against Anaheim, due to what has been referred to as a minor knee injury. Muzzin said that he hurt himself trying to hold a puck in the attacking zone during a practice session. Muzzin skated by himself following the team’s practice session on September 25. Muzzin reported no issues after the quick skate. “Both knees are now braced up, so we’re good to go,” said Muzzin. Although Muzzin said he was “good to go,” the final arbiter on that question will be his head coach. 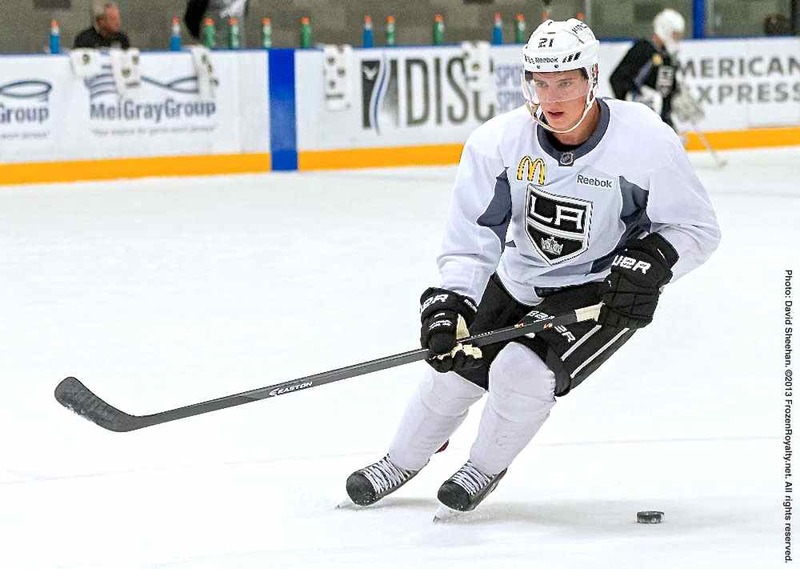 Forward Dustin Brown, who suffered a pulled hamstring on the first day of training camp, skated with the team for the first time on September 25, but he left the ice quickly when practice ended, and bolted from the team’s practice facility as soon as he could. The reason? His wife, Nicole, was expected to give birth to their fourth child. “His wife went in [to the hospital] at 6:30 this morning,” Sutter noted. As for the injury, it is no longer an issue. But Brown lost ten days of training camp, putting him behind the eight-ball. How will that impact whether or not he plays during this weekend’s final two pre-season games in Las Vegas?